The transition from iOS 6 to iOS 7 was a jarring one for many. If last year’s visual overhaul and significant early bugs rubbed you the wrong way you should find your upgrade to iOS 8 a much more pleasant experience. Apple bills iOS 8 as “the biggest iOS release ever,” but when you complete the upgrade, you may not notice that much of a difference beyond a couple of new icons on your homescreen. In fact, much of this operating system’s potential is in the hands of third-party developers. By updating some of its own apps, Apple has included demonstrations of what can be done, but the true power of what’s under the hood will be realized over the coming days, weeks and months. Still, there are some tangible improvements here that you can make use of right away. iOS 8 refines the modernizations that version 7 introduced while hooking into Apple’s cloud services more than ever and making life easier for those who immerse themselves in the company’s ecosystem via multiple devices. Although there are notable new and reworked apps that we’ll cover later, some of the most noticeable changes in iOS 8 are small ones that simply make your life that little bit easier. Push notifications have received an upgrade. Banner notifications that appear at the top of the screen can now include interactive elements that allow you to handle them right away. 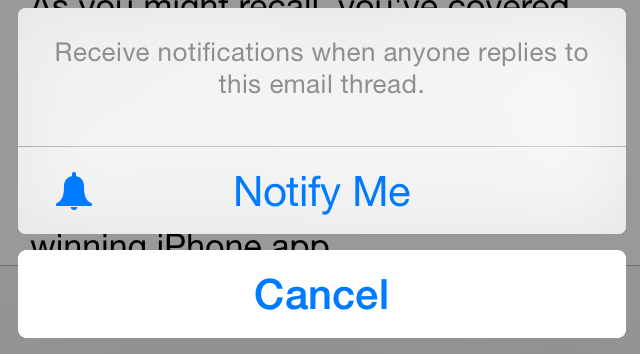 For example, banner notifications from Messages can be pulled down to reveal a quick-reply box. Rather than having to switch out of your current app to reply to that urgent question from a colleague, you can send your response right away. Likewise, calendar notifications and incoming emails offer interactive notifications. Interacting with apps without having to open them can be incredibly useful for both users and developers. The ability to enter text takes them beyond the similar feature that Android has had for some time. Expect third-party apps to introduce support for the feature almost as soon as iOS 8 goes live. Of course, these notifications rely on you catching them at the moment they appear. Once they’re relegated to the pull-down Notification Center, you’ll have to swap apps as normal. Speaking of which, Notification Center is still lacking an important feature for anyone who receives lots of notifications – the ability to clear all of them at once, you still have to clear them on a per-app basis. Sure, it’s a minor inconvenience but one that could easily be solved. One area where Notification Center has had an upgrade is on the Today tab. While you’ll still see the same calendar summary, weather forecast and stock quotes as before, developers can now add their own widgets to expand its functionality. We’ve yet to try any third-party widgets but as we review iOS 8-capable apps, we’ll be sure to reflect on how this new capability is being put to use. Beyond notifications, the multitasking menu that a double-tap of the Home button reveals has been updated to offer quick access to your most recent contacts, giving you the option to call, message, email or FaceTime them. 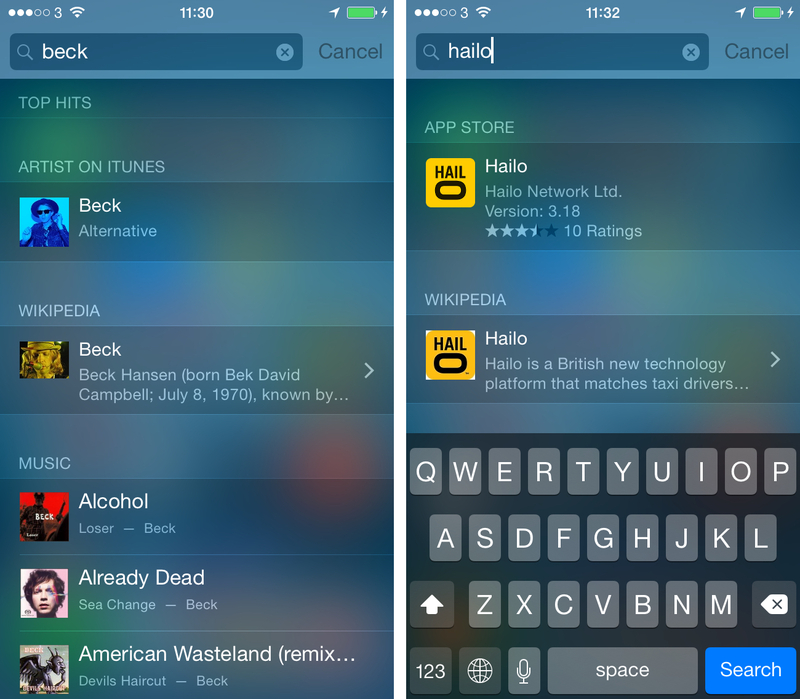 Spotlight search has some new tricks up its sleeve. No longer just about searching your own device, it can now act as a limited-scope search engine, pulling in results from Wikipedia; news services; Apple Maps data; the iTunes Store, App Store and iBooks Store, as well as suggestions of popular websites you may be looking for. It all works from Safari’s combined address/search bar, too. While this expanded search capability is useful at times, the problem is you can never tell exactly what it will suggest, and thus how useful it will be. App Store search can be incredibly useful, for example, but it doesn’t always work. When I restored my iPhone from a backup, I didn’t notice that the Uber app didn’t install. 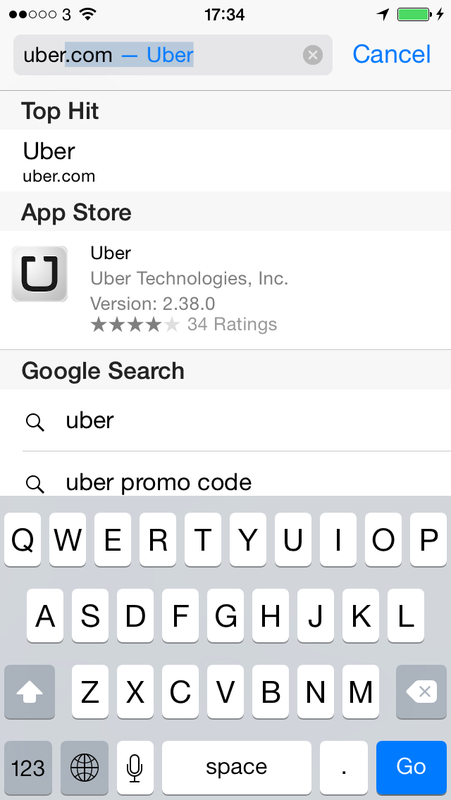 So when I searched my phone for the app, Spotlight returned a direct link to Uber’s App Store page. Perfect, right? Well yes, although a search for rival app Hailo returned nothing on the first couple of attempts, eventually working after three or four goes. It ends up feeling like pot luck as to whether you’ll get the result you’re after. Similarly, when I searched for ‘Beck’ (the musician) I got a long list of his songs on my iPhone, puzzlingly followed by three Web results for a cinema in the UK town of Beckenham (which I’ve never been to). A repeat search one minute later worked much better, returning relevant iTunes and Wikipedia results in addition to the songs on my device. There are some occasions where it seems to work reliably. A search for the movie ‘Avengers Assemble’, for example, consistently returned relevant links to the iTunes Store, Wikipedia and the App Store. We can probably put the unreliability down to quirks that will be ironed out over time. If Apple continues to refine Spotlight along with Siri, it could have a real Google Search rival on its hands, but it’s not there yet. This is one area where Android is a long way ahead. While I’m not suggesting Apple could easily beat Google’s 15-year head start on search, if Spotlight worked reliably to return the results you expected, you could at least know when best to take advantage of its convenience. Siri continues to creep ever closer to its goal of being a truly useful personal assistant. The feature now has a couple of new features copied from Android’s Google Now implementation. Just as some Android devices allow you to ‘wake up’ Google Now by simply saying “Okay Google,” Siri now has the option of switching on a “Hey Siri” keyphrase, although it only works when your device is plugged into a power source. That restriction limits the keyphrase’s utility but it should also save battery resources taken up by the device having to constantly ‘listen’, and it will reduce the likihood of multiple iPhones going off at once if someone shouts “Hey Siri” in a busy room. There’s also a music identification feature built into Siri now, powered by Shazam. Siri can identify songs and give you a ‘Buy’ link to the iTunes Store. While it worked fine in earlier beta releases of iOS 8, it was removed in the Gold Master version that we based this review upon. However, Shazam tells us that it will be back in the version that goes live to the public. 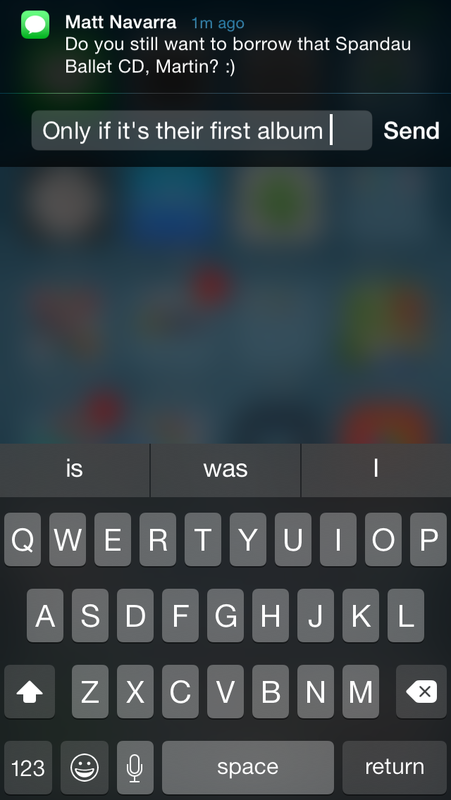 iOS 8 also brings with it the potential for Siri to control home automation devices. Imagine turning down the lights by talking to your phone, for example. As developers adopt Apple’s HomeKit SDK, we’ll see features like this begin to appear. One of the changes in iOS 8 that I was most looking forward to was the new keyboard and support for third-party keyboards. 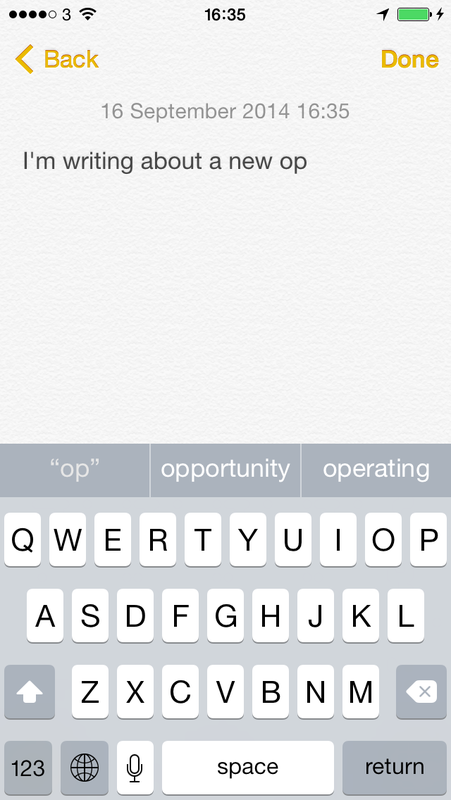 The long-established iOS keyboard was my biggest gripe with iOS. I made so many typos with my big thumbs on those small keys, and there’s a reason that ‘Damn You Autocorrect’ became a meme – it’s never been that reliable in guessing the word you meant to type. The new iOS keyboard takes cues from popular Android add-on SwiftKey. As you type, it offers three dynamically changing suggestions for a word to autocomplete or correct, or even what word you might want to type next. Train it well enough with your style of writing and in theory, you should be able to regularly type whole sentences from the suggestions (if like me, you find yourself using the same stock phrases regularly in conversations). It works well, although the different approach to typing takes a bit of getting used to at first. 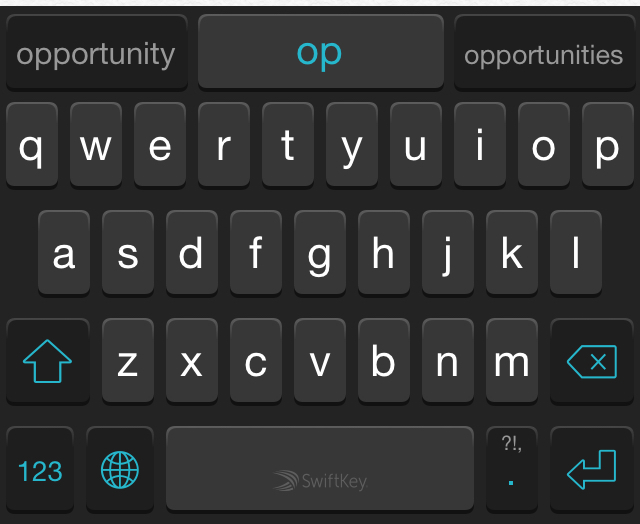 Even experienced SwiftKey users will have their training challenged as the new default iOS 8 keyboard tends to display the best match for your next word as the leftmost of the three suggestions, whereas SwiftKey usually picks the center. Your muscle memory will be challenged! Still, if you’re not happy with the built-in keyboard, no need to worry – Apple now accepts third-party alternatives for the first time. Expect a wild bunch of options to emerge in the coming days, weeks and months. We’ve lined up a separate review of SwiftKey for you today, but established rivals from the Android world like Swype have their own alternatives on the way, and the Popkey, the GIF-based keyboard that recently emerged, demonstrates that there’s plenty of room for novelty here too. It’s good to see developers embrace this new opportunity, although the implementation of working with keyboards in iOS 8 could be improved. Any keyboards you install get a home screen icon just like any other app, which feels like unnecessary clutter. It would be nice to simply be able to manage what are essentially plugins from the operating system’s Settings. If you use the built-in iOS Mail app, you’ll find that it has learned some tricks from the competition like Gmail and Dropbox’s Mailbox app. There’s automatic identification of reservations, flight confirmation emails and phone numbers, allowing you to easily add events to calendars or contact details to your address book. From Mailbox comes left and right swipe actions across each email in your inbox. 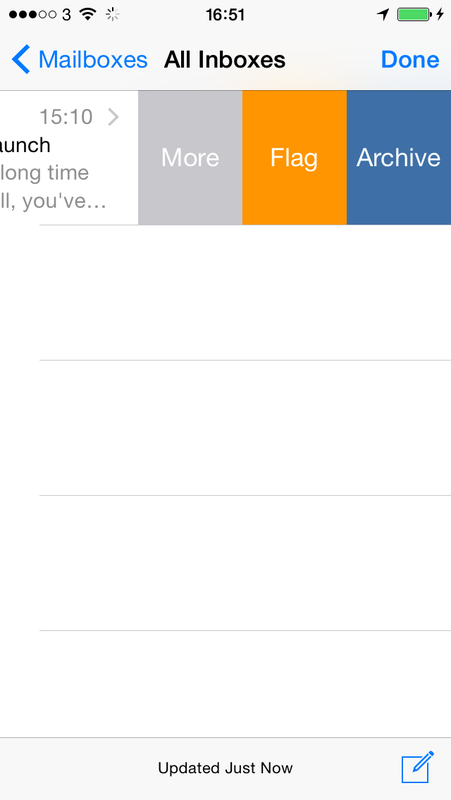 A long swipe to the right will mark an email as read, while swiping in the opposite direction archives it. A half swipe to the left, meanwhile, reveals additional options such as flagging an email or moving it to trash. While it doesn’t feel quite as refined or powerful as Mailbox’s approach, swiping has become such a natural factor in interface design that it would almost seem strange to not be able to slide your finger across your inbox as a method of control in 2014. Going deeper within Mail, you can now set up notifications for important emails so that even if you don’t get notified about every new email that comes in, important conversations still get your attention. 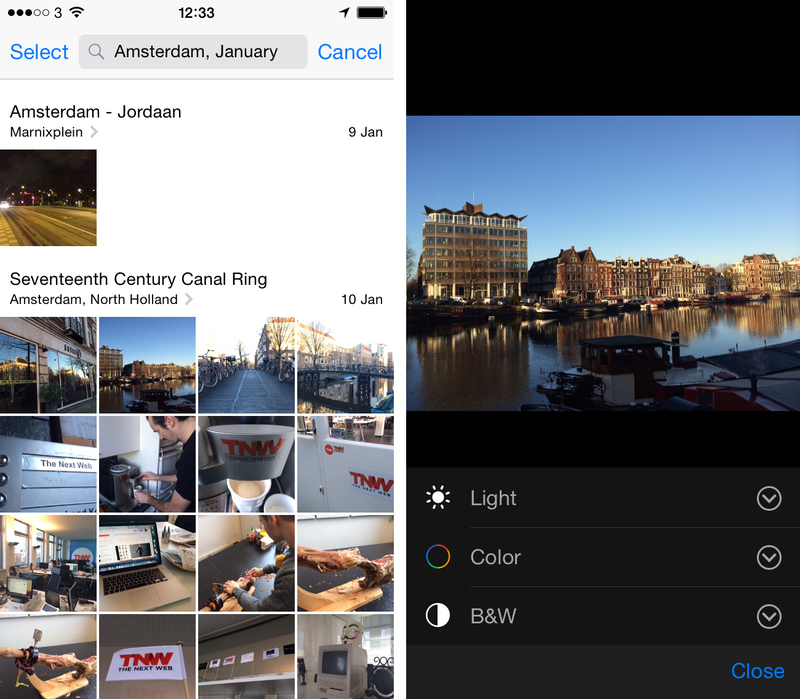 iOS 8 sees Apple start to converge all of its photo-related software into one app. Goodbye iPhoto for iOS, your days are over. In fact, this is a process that will eventually see OS X users lose iPhoto and Aperture in favor of an iOS-style Photos app, too. 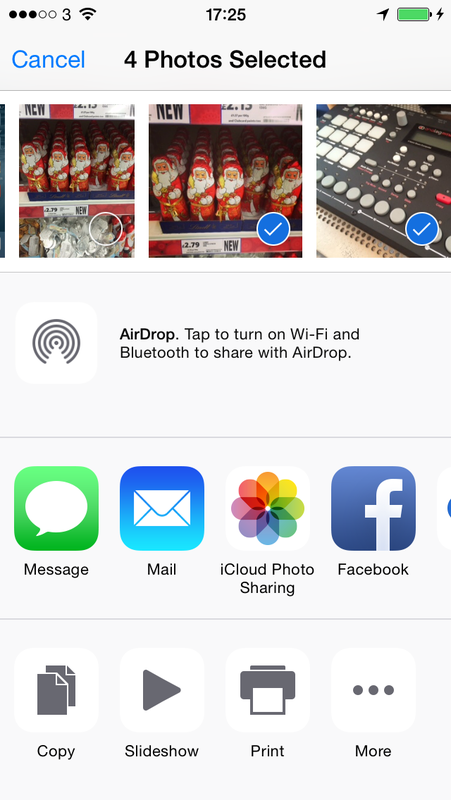 The new Photos app is very similar to its iOS 7 predecessor, but it’s far more powerful. Location and date-based search allow you to quickly find all your photos from all of your vacations in Hawaii, or combine with a date to get more specific. In the example below, I narrowed down my numerous trips to Amsterdam to just the one in January this year, for example. The editing tools built into Photos are far more powerful than before, including precise control over light and color settings. What’s more, third-party apps can add editing features to the Photos app, and I’m looking forward to seeing how this is exploited. Meanwhile, the iPhone’s Camera app has been upgraded with a Time Lapse video feature that works similarly to Instagram’s Hyperlapse app without the clever image stabilization technique. So yes, a stand of some kind is ideal here (or just a very steady hand), but you can still create fun results. Of course, the iPhone 6 and 6 Plus offer image stabilization features which could well help, too. Otherwise, I’d stick to Hyperlapse if you want a truly smooth handheld result. I recorded the short video below, holding my iPhone as steady as I could. The result is acceptable for a timelapse, but more wobbly than I’d like. Look out for a separate deep dive into the new photography features in iOS 8, coming soon in our Creativity channel. The first of two completely new apps that you’ll find on your homescreen when you open iOS 8 for the first time (except on an iPad, where it’s not available yet), Health is one of the areas of the operating system that relies on third-party developers to achieve its potential. Think of Health as a hub for your physical activity and medical data. Multiple apps can feed information into it so you can see it all in one place. For example, your activity tracker may contribute the steps you take, your nutrition diary app may add your calorie intake, etc. 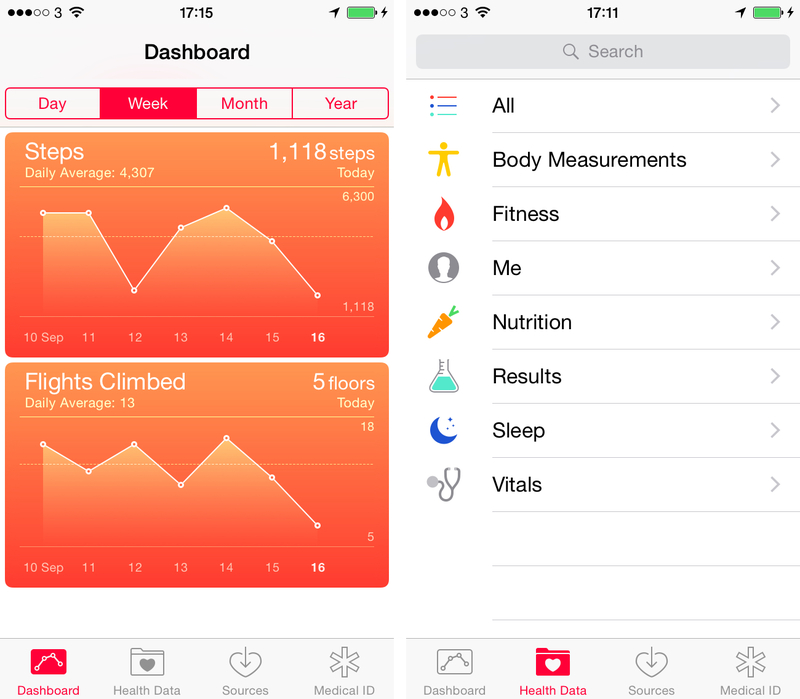 If you go all-in on health tracking via your iOS device, it could be a really powerful tool. On a very basic level, it gives you at-a-glance summaries of all the data in one place, but beyond that, Apple has prepared permission-based sharing of specific information. So, a developer could set up a method of sharing your daily weight measurements with your doctor, while you can allow one app to see data collected by another app. If you don’t have an app compatible with Health for any particular metric, you can manually enter data, although Apple is seemingly shying away from encouraging this approach as it sits behind an ‘Add Data Point’ option. Health currently lacks Apple’s usual user-friendly sheen. There are a lot of text-based menus to scroll through here and it’s not immediately clear what you’re supposed to do with it. Once I added some manual data for my step count, Health started pulling an automatic step count from the M7 motion coprocessor on my iPhone 5s but it wasn’t clear that this would start happening and there doesn’t seem to be a way to switch it off if I wanted to. One thing it’s worth considering doing when you first get iOS 8 is setting up a ‘Medical ID’ card in Health. This small but potentially life-saving feature lets you add your name and date of birth, an emergency contact, your organ donor status, your weight and height, plus medical conditions, allergies and reactions and any medication you’re taking. When your phone is locked, a medical professional can tap the Emergency button and access the Medical ID. In certain situations this could be the most important information you ever enter into your iOS device, so it’s worth doing right away. Of course, you could argue that the Medical ID is a potential privacy violation if your device is stolen, but that’s a choice you’ll have to make for yourself. Given that the changes in iOS 8 aren’t as obvious as in the previous major revision, Apple has added a simple ‘Tips’ app to help you make the most of the operating system. Apple promises that the tips on offer will change over time, but if you haven’t been paying attention to this review and Apple’s own marketing, it’s worth a scan through the app before popping it away in a folder. A neat addition to Messages for iOS 8 is support for video and audio messages. Video is captured with the Camera app, exactly as you’d imagine, but a special audio recording interface has been built within Messages especially for the task Both types of messages play back within their own ‘bubbles’ in a conversation. Group messaging has become a staple activity for many people, especially during special events. In iOS 8, you can do it straight from Messages. Admin options allow you to name conversations, add and remove members, mute alerts from the conversation and even leave it if you choose. While these features won’t set the world alight for everyone, they work well and they’re nice extras for people who send a lot of iMessages. That’s especially true if you own a Mac as of course messages are synced there too. Cloud services are a big part of iOS 8, but you’ll only really see the maximum benefit if you have multiple iOS devices or a Mac, too. iCloud Drive is perhaps the most obvious part of the equation. Similar to Dropbox, it allows you to painlessly save date from apps and open that data in the same app on another device. 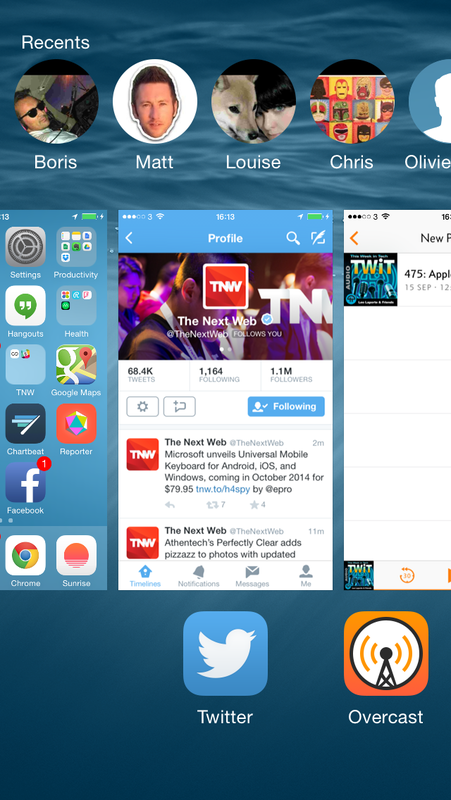 It even works from iOS to OS X and vice versa. So, if you open a document in Pages for Mac that you just started on your iOS device, it will be synced and ready to go – even down to the same cursor position. As with much of the rest of iOS 8, it’s the third-party developers who will really make this come alive with cross-platform sync for their apps. 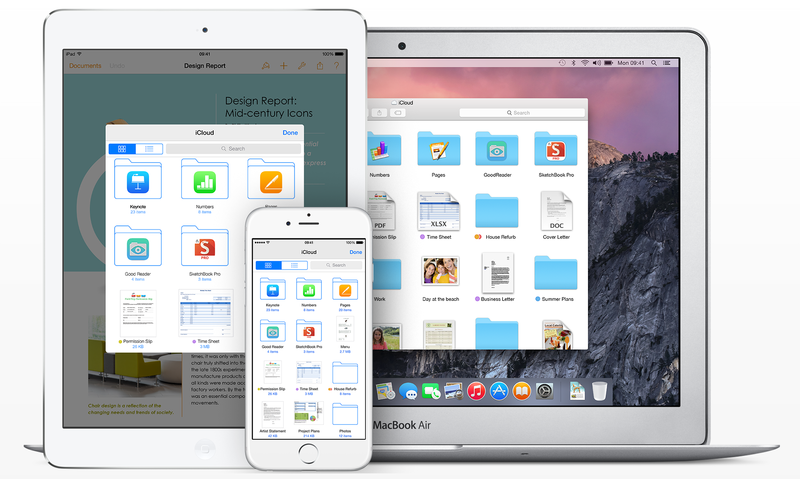 To make the most of it, you’ll need to be running OS X Yosemite, which supports iCloud Drive. As the new desktop OS is still in beta, we’ll hold off on making full judgment of this feature until Yosemite hits prime time, expected to be next month. Also reliant on OS X Yosemite is a neat feature that will allow you to answer calls and text messages from your iPhone on your Mac. Again, there’s a lot of promise here – I regularly put my phone in my pocket on silent and miss calls that I’d get if they were routed to my Mac – but we’ll need to wait until we can review Yosemite properly before giving our verdict. A recurring theme throughout this review is that much of iOS 8’s potential rests with developers. We’ve already mentioned Notification Center widgets, HomeKit integration with Siri, third-party keyboards, Photos plugins, iCloud Drive support and Health (with its associated HealthKit SDK) but there’s so much more to look out for as developers introduce iOS 8 updates. 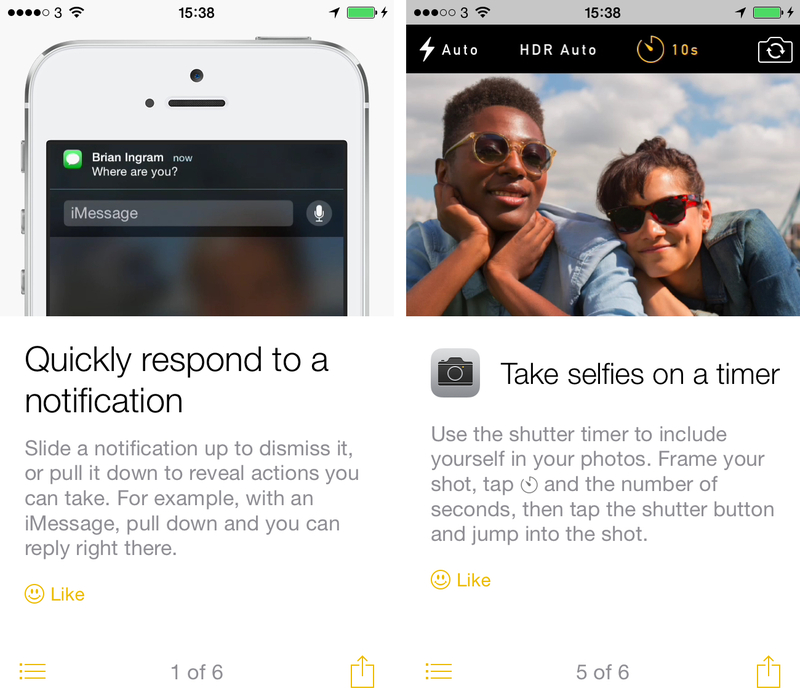 The ‘Share’ option for photos, videos and the like has been opened up so that developers can add their own apps. Expect your favorite social networks, photography apps and ‘read-it-later’ services to be among those whose icons start to appear in your share menu as their apps are updated. Other actions beyond sharing are supported, too. Apple gives the examples of watermarking an image or translating text as areas that developers may want to explore. This screen will most likely see many of your favorite app icons added to it soon. If you have an iPhone 5s, 6 or 6 Plus, you’ll find that the TouchID sensor becomes more useful over time, as developers can use it for their own authentication purposes. We’ve already seen how 1Password will allow users to log into their favorite apps and websites with their fingerprint, and how Apple Pay will use it to authenticate payments, but there are bound to be many more possibilities too. So, should you upgrade right away? There’s plenty more to be discovered in iOS 8. Family Sharing is a notable addition that allows families (or any group of people) to share app and media purchases, photos, calendars and locations, and children can ask parents to buy something they’re interested in. No doubt we’ll get to experience this in action as entire families upgrade to iOS 8 this week. If you’re an ‘iOS family’ and you really don’t mind everyone else seeing what you buy and where you are, it’s worth exploring. In all, iOS 8 is a real refinement of the changes introduced in iOS 7, and it’s more customizable than ever. It’s interesting that while there are plenty of ‘Android had that first’ moments here, Apple has gone down the route of allowing developers to hold the keys to a lot of the customization here, and thanks to its tight app approvals process, Apple by extension still controls exactly how much you can make iOS your own. You can’t go installing your own icon sets or building custom ROMs, but with custom share options and app actions, a choice of third-party keyboards and the ability to add new photo editing tools, this operating system is more flexible than ever. Should you upgrade today? If you’re the play-it-safe type, then wait for the inevitable bug-fix update in coming weeks, but none of the bugs we encountered in the Gold Master version we reviewed are deal breakers. If you want to take advantage of those updates you see coming out from your favorite app developers, well, you’ve got to be in the game. Even though the additional features here aren’t all world-changing in their own right, they add polish and utility and the way third-party developers take advantage of them via the app updates that start to appear today will very quickly make iOS more ‘your OS’ than ever before. And with Apple Pay and some serious graphical oomph from technology like Metal still yet to be exploited, this is an operating system that is going to keep giving us new things to play with for some time to come. When will you be downloading #iOS8?